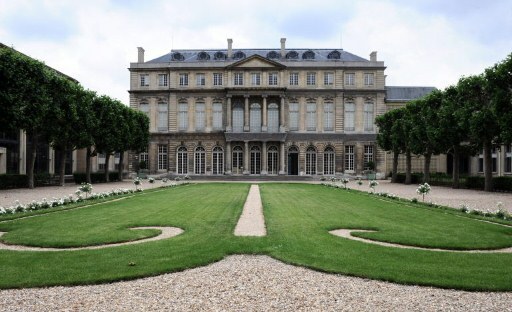 After 16 years of hidden existence, the gardens of the Archives Nationales has opened to the public. Walking along the darkened walls of the French National Archives in the Marais, you would not even have suspected a garden was behind. But yes, it’s true. 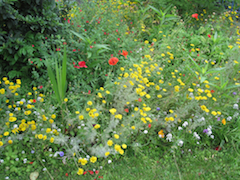 And it’s beautiful: 8000 square metres of green space in the stony heart of Paris. From now on you can cross a whole block between rue des Francs Bourgeois and rue des Quatre-Fils. It’s Louis Benech, the famous French garden architect, who started the reshaping of the gardens. But it will take some months before everything will be ready. 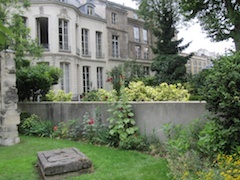 During his career, Benech has created over 250 garden and park projects, among them the Tuileries Gardens, the gardens of the Elysée Palace, those of the Royal Monceau and Shangri-La Hotels, of the French Ministry of Foreign Affairs, the BMW headquarters in Germany, the Island in Aswan, Egypt, etc. etc.etc. But this is not just another garden, it is historical ground. It looks, in parts, as if it has been abandoned for centuries. There is a classical French and another romantic part. There are flower-filled meadows, huge trees, stone pines. And, the most exciting thing: once in the garden, you are surrounded by French memories. Here, in the National Archives, everything important is stocked. Sure, the Archives will move into a new building outside of Paris next year (if not 2013), the Paris premises keeping only pre-French Revolution records. But at the moment they are all here: the original Declaration on the Rights of Man and of the Citizen dating from 1789, letters from Louis XVI, a papyrus dated AD 625 issued by King Chlotar II. Just let your imagination run wild. The Garden for the House of History? There has been a lot of trouble around the National Archives lately. President Nicolas Sarkozy, the troublemaker, cooked up the idea of the Maison de l’Histoire de France, the country’s first national museum of French history. Where? Here, in a wing of one of the beautiful palaces of the Archives. But French historians and employers of the archives didn’t like the idea of distilling centuries of Gallic gloire into a chronological display. Protesters have taken to the barricades because many people wonder what kind and whose history will be told here? There is no such thing as a national identity in this increasingly fractious nation. The protests against the house of history are also the reason why the decision to open the gardens to the public met mixed feelings. Critics say, that this would represent a danger for the documents stocked inside. For me, this is French attitude: once your are on the barricades, you have to stay there, by all means. I, for my part, enjoy this new garden. And I’m sure you will too when cruising through the Marais.